fashionably petite: Everett Neckwear Cocktail Party at Teich - Learn to Tie a Bow Tie! Everett Neckwear Cocktail Party at Teich - Learn to Tie a Bow Tie! 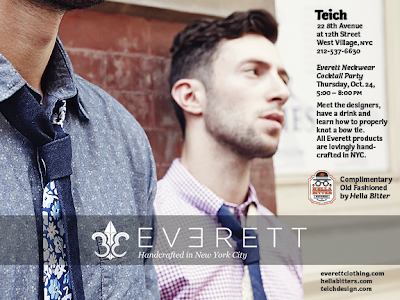 Made and based in Brooklyn neckwear brand, Everett, is hosting a cocktail party at West Village boutique and shopping destination, Teich, 22 8th Ave at 12th Street on October 24th from 5-8pm. In addition to meeting the designers behind Everett, guests will enjoy cocktails by Hella Bitter and learn to tie a bow tie.